I love pinhole photography and thanks to Mike CG, I am the proud owner of a Holga pinhole lens that fits Nikon! What fun! Thanks Mike! 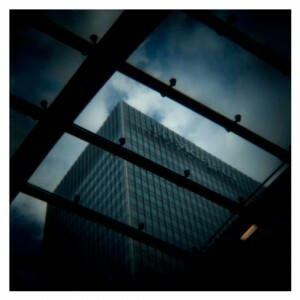 I’ve been working on a project called “Pinhole London” (see some examples in project galleries). Today I had a wander around Docklands snapping away. Pinhole is so hit and miss, that it is a real boon to be able to do it digitally – although I don’t expect the purists will agree with me! Today’s pic is the building of JP Morgan – there is something apposite about it looking as if it is behind bars!